How long will it take me to reach my savings and debt payoff goals? What would happen if I saved a little bit more? How much should I contribute to each goal each month? How should I prioritize my financial goals? You'll need some idea of how to answer this question before using the savings snowball calculator. You can get some guidance from most personal finance books, blogs, and workshops, or you might get a financial advisor to help you. Your financial goals might be as simple as "Save $1000, Start an Emergency Fund, Pay off my Credit Cards." 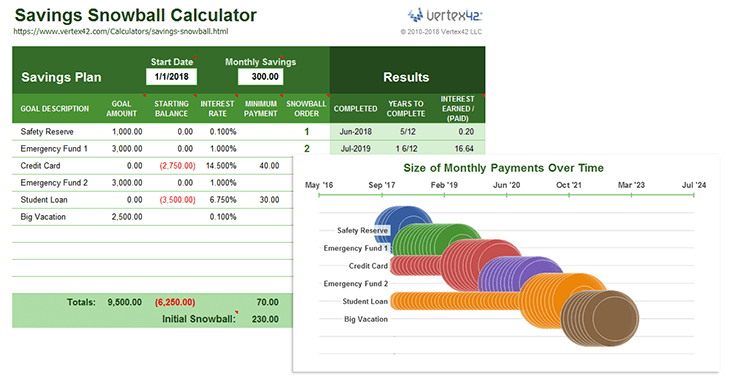 Whatever the case might be, the whole purpose of the Savings Snowball Calculator is to give you a simple tool to evaluate your plan and put it into action. Reaching other short-to-mid-term financial goals - college, vacation, down payment on a home, etc. First, I'll explain the Savings Snowball concept and provide some background on how it was developed from the Debt Snowball. Then, I'll show some of the features of the spreadsheet. After that, if you have any comments or questions, feel free to comment below. What is a Savings Snowball? Put simply, a savings snowball is a strategy that involves focusing on one financial goal at a time. You first need to create a budget and figure out how much you can put towards savings each month. You may decide to allocate some of your savings to a few different goals (referred to as Minimum Payments in the spreadsheet). The monthly savings left over after making the minimum savings payments is called your Savings Snowball and you apply it to your highest priority goal first. After you've completed your first goal, you apply the savings snowball to the next one. For example, let's say your second goal is to pay off a credit card. If you have been making monthly $30 payments on that card, after you have paid it off you can add the $30 to your snowball, speeding up the process of completing your next goal. How does a Savings Snowball compare to a Debt Snowball? It is almost exactly the same concept, mathematically. The main practical difference is that savings accounts have horrible interest rates, so while the debt snowball has a lot to do with interest rates, the savings snowball is more wholistic and focused on prioritizing and reaching goals. A savings goal might be to reach $1000 starting from a balance of $0. A debt payoff goal would be to reach $0 starting from a balance of -$1000 (note the minus sign). In this spreadsheet, a debt is simply a negative balance that you are trying to bring up to zero. The origin: The idea of a savings snowball is not unique. In fact, the general idea has probably been around for millenia. The phrase "savings snowball" is just a more modern term that became popular because of the popularity of the "debt snowball." Soon after I created the Debt Reduction Calculator nearly a decade ago, I started getting requests for a spreadsheet that could extend the process to savings. Most of these requests came from people using a debt snowball who realized "Hey, this ought to work for savings, too! Do you have something like that? I'd like to roll my debt snowball into a savings snowball." So, I created a basic savings snowball spreadsheet in 2010 and shared it with a few people over the years. It wasn't until recently, after helping with a short-course on personal finance, that I realized how useful it could be to have a calculator that handled both savings AND debt payoff goals in any order or combination. After all, you don't typically want to aggressively pay off debt until you have a decent safety reserve and a start on an emergency fund. The Schedule worksheet allows you to list occasional Extra Savings, shown in the example above as the two $250 amounts on rows 34 and 45. To stick with the snowball theme, the strategy of making occasional extra payments above your normal budgeted total savings is referred to as snowflaking (see What is a Debt Snowflake?). Note! Results are only estimates. The spreadsheet assumes fixed interest rates and monthly compounding, so while the approximations may be pretty good, the results won't match your account statements penny for penny. I created two different graphs in the spreadsheet to visually represent the monthly payments over time for each of the separate goals. Unless you are a spreadsheet nerd like me, you probably won't care how these were created, but they represent a unique type of chart that I made specifically to show the snowball effect. The first graph was created using a Bubble Chart - one of the built-in chart types in newer versions of Excel. 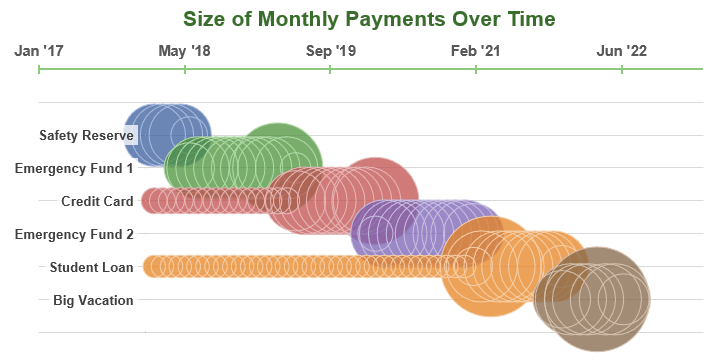 The size of the bubbles show the relative size of the monthly payments. The horizontal axis shows the dates of the payments. The goals in this graph are listed in order of priority with the snowball being applied to the top goal first. You'll see that as each goal is completed, the snowball payment is applied to the next goal. Notice that for the credit card and student loan, only small monthly payments are made at first, but after the snowball is rolled into those goals, they get paid off pretty quickly. I figured a snowball chart might be cool to show with circles, but the engineer in me complains about the fact that the snowballs are overlapping each other (making the interpretation of the graph difficult). So, I think the next graph is the best one. In this second chart, the distance between the gridlines represents the total monthly savings. 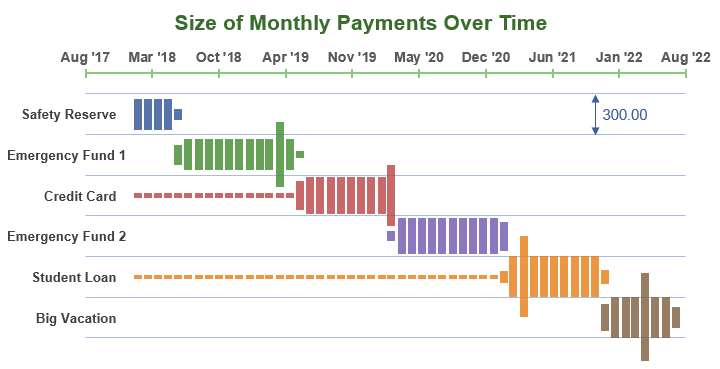 The vertical width of each of the bars represents the size of the monthly payment. You can see more easily with this graph how the full $300/month is allocated. You can also easily see where the extra annual $250 payments are occurring (because the bars are wider than the $300 gridlines). If you have any questions or comments related to the savings snowball concept in general or how to use (or interpret) the spreadsheet, please comment below. 1) I love your Lucid programs. Disgusted with Microsoft, haven’t been able to open corrupt Office 365 for a year and Microsoft can not reinstall unless I pay $125.00. I already paid $69 and can’t use. 2) I plan to start using Vertex and Open Office, but have concerns that your copies of excel etc may not be available if i do not purchase Office 365 again. @Gene … 1) I’m personally still a fan of paying for Excel directly rather than subscribing through Office 365 … but that’s just me. 2) Unfortunately, this Savings Snowball Calculator is an example of a spreadsheet that is not compatible with OpenOffice. I was able to make a couple versions that work in OpenOffice and Google Sheets, though without the full functionality of the graphs. 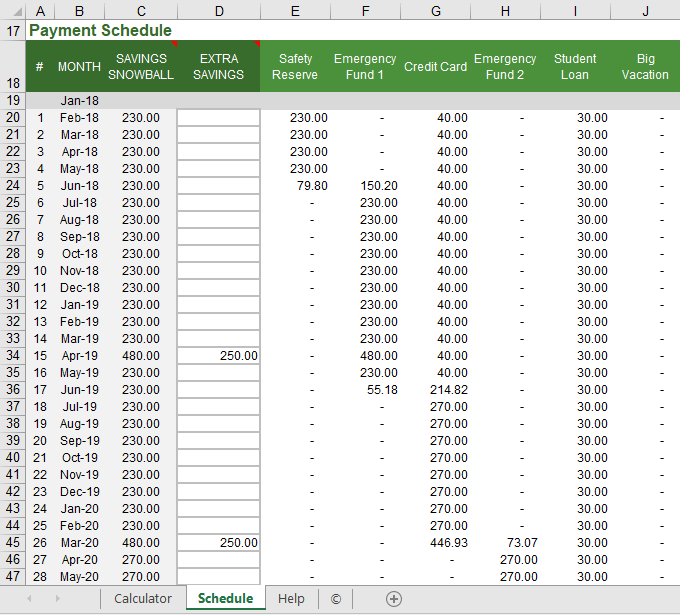 Excel is definitely superior when it comes to creating spreadsheets with as many calculations as this one has. The Google Sheets and OpenOffice versions take a long time to recalculate. I added more lines to the calculator to list all our goals, but after the tenth one the results columns just have hashes in them. I’m probably just missing something easy. Any ideas why this is? @Kim, It is not sufficient to just add more rows. There are many other things that would need to be modified. Because this spreadsheet does most of what the original Debt Reduction Calculator does, if I create a version that allows more than 10 goals, I will need to sell it with the extended version of the D.R.C. 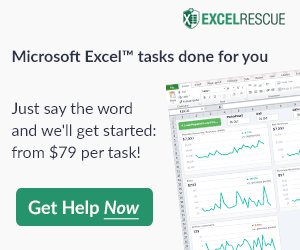 Hi – Is it possible to make the sheets part of one of my Excel files? I keep all finances (budgets, reports, etc in one file and would like to copy the pages into that file. @Phoebe, Not easily, no. Might be easier to move other budget worksheets into the savings calculator. @Len If the values in red are in the Starting Balance and look like (2750.00), that means the value is negative and that is correct (for a loan). Same with interest earned (paid). A negative interest earned will be displayed as a red negative number. If it’s anything else, you’d need to be more specific, and maybe email me a screenshot or something. I still use Office 2007. Please make this backwards compatible so I can use it. I so desperately need this spreadsheet. I need to get my 502 credit back on track from a divorce and broken finger/wrist.